This chapter provides a conceptual framework, guidance, and a detailed structure for conducting an initial interview and history-taking. It is guided by principles of infant and early childhood mental health, as the first part of a principled evaluation process of families caring for infants and young children, pregnancy to age 6, seeking mental health services. The practitioner is guided on the “how” and “what” of the interview process, in which the nature of the interpersonal relationship between the interviewer and family is understood as a “co-constructed” process, where the first task is to ensure that the family feels listened to, understood, and safe. Domains of inquiry are examined beginning with an understanding of pregnancy, birth, and early parenting, an understanding of the reasons for seeking services, leading to an exploration of the sociocultural context of the family and specialized inquiries in cases of trauma and oppression, using a diversity-informed lens. 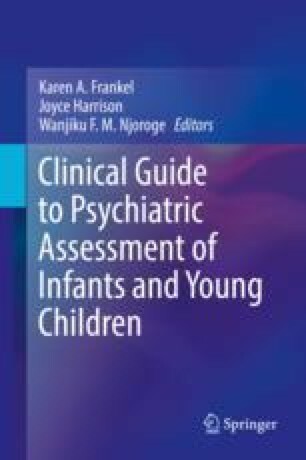 Included are templates that highlight important areas of information gathering, guidelines on conducting infant and young child observations, ways to assess imminent concerns, and ending with a case vignette. History-taking is the first experience of the helping systems. How it begins and how it ends make an enormous difference in how the family experiences the evaluation process, and can influence their decision to engage in the intervention plan. No conflicts of interest to report.